Snow boots in the winter. Grass and water from the summer. Mud and dirt from every season. The entryway to our homes take a beating all year through. Yet it’s also the place where we welcome guests, where people make a first impression about the home that lies beyond. It’s how we showcase who we are, express our style, and set the tone for all that enter. It’s a place designed for entry; but in reality it does a whole lot more. 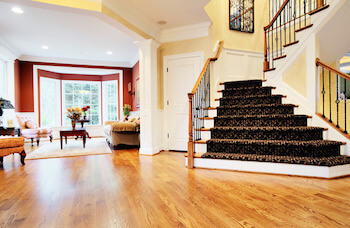 When you decorate an entryway, the best place to start is at the bottom: your flooring. An easy to clean, easy to maintain flooring can allow you impress without the fuss, and be ready for whatever life brings your way. You may also want to consider these tips. Because your entryway will get the most wear and tear out of any room in your home, its important to be able to change it up as the need arises. Flexibility is key. Tiling is always a good choice, because of its hardness and its durability. And with thousands of color and pattern choices, the options are endless. Yet tile isn’t your only option. You can also go with many other flexible options. Cork squares have been increasing in popularity because of their sustainability factor, and the fact that they can handle moisture, and are a natural sound barrier. And because the squares can easily be lifted and replaced as needed, it’s a great way to keep your floors looking new. Vinyl plank tile is also another flexible option. They are thin, durable inexpensive tiles that are easy to install, and therefore also easy to replace as needed. The planks attach to one another with sticky strips, and can be laid in place and replaced as needed. Plus they look great and can add visual appeal from the moment a person enters. There are more than one way to keep your entryway looking great all year through. Instead of constantly having to clean and maintain your floor, protect it instead. Rugs can be a great way to add appeal to the entryway, while protecting it from the elements as well. Choose a rug carefully and you’ll be able to pick it up and wash it whenever you choose. And if you have many styles and colors available to you, you’ll be able to change up your look any time of the year. Whatever direction you choose to go with your entryway, durability is key. Not only will it have to withstand the elements from reaching it every day, it will also have to endure the hardships of whatever your family can throw at it. Like dropping your car keys over and over again. Or throwing a backpack or two, sports equipment, or even supplies for that next home improvement project down as you make your way in and out of your home. Have any additional questions about the best materials you can use for your entryway? Give us a call or stop by today.